1. Paint doors and trim. Our doors only have primer on them...it was actually a miracle we got them installed in the first place given our dwindling budget at the time. A nice paint of coat will really make a difference. Same goes for our trim which needs to get some caulk and paint as well. 2. Install hallway closet doors. We only have two of them: one to the hallway closet and the other to our laundry closet but they are very visible to guests and quite unsightly! We've talked about installing barn doors. We're thinking about bolting two standard doors together and buying the barn door hardware. Have any of you done something like this? 3. 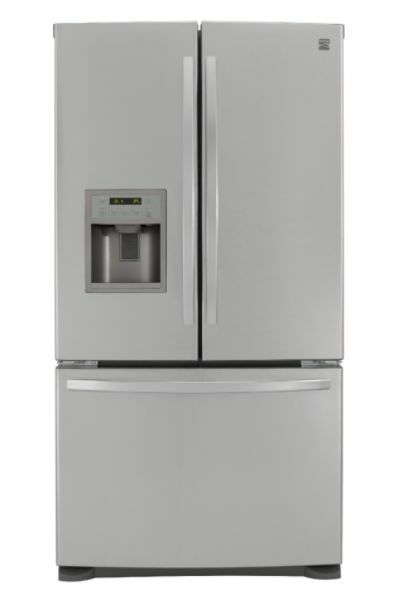 Buy stainless steel fridge. Our appliances are all Kenmore, so this one would fit in nicely. 4. Install light can inserts. Definitely a honey do item...'nough said! 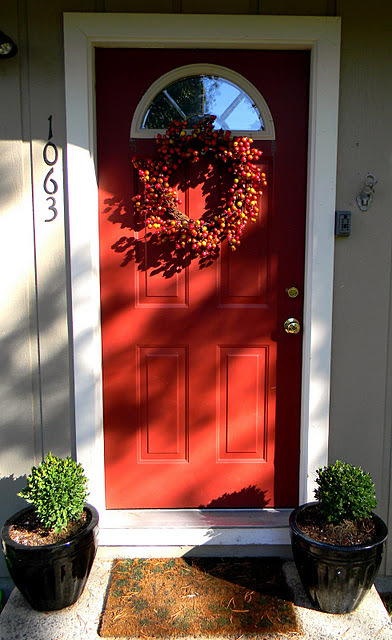 While I love our red door, it needs to be updated. I'm thinking something more craftsman. Only...in red. Or blue...here we go again! I've loved the red, but want to incorporate something more fresh. They're noticeably missing and instead of buying matching bamboo shades, I thought stripes would be nice! Courtney's drapes are dreamy...I want them! 8. Find a new piece of furniture for the TV. This is a tough one...anyone have a piece they love? 9. 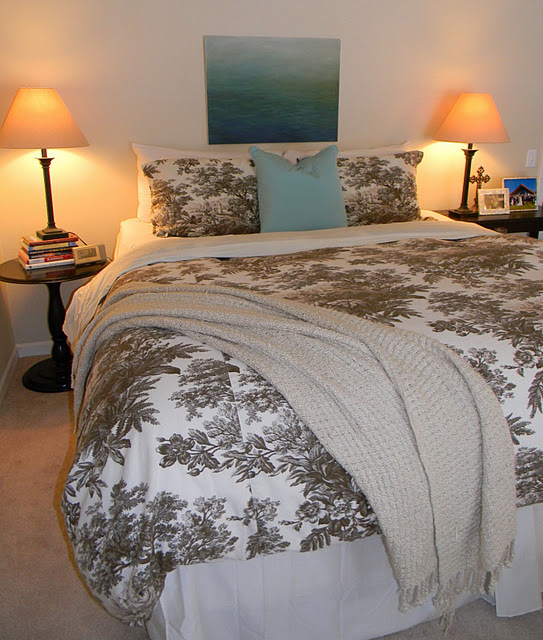 Complete master bedroom decor. I know...I know...I need to jump on this! I've gotten new lamps and solicited your advice on pillows. I also want to add a headboard, but that might be too ambitious for now! Yay!!! I am most excited about this transformation this year. We'll wait to find out the gender before we get started, but I have been pinning away and daydreaming ever since we found out we're expecting! I did get this adorable sock garland from my dad and step-mom for Christmas...maybe a fun starting point? 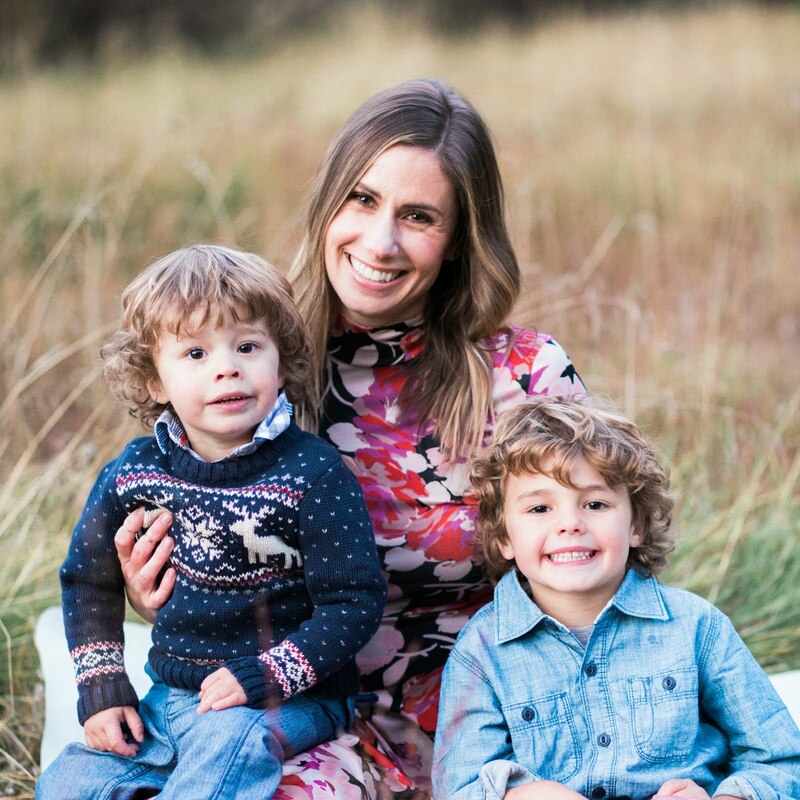 For more nursery ideas, visit Alexa and Kirby's blog today to see what I have in mind! What's on your honey-do list this year? How many of these things do you think I'll actually get done!! Only time will tell!! You are totally inspiring me to make some house resolutions. Good luck on accomplishing your goals! You have a beautiful home!! I love all of the things on your "honey do" list. It'll be fun seeing it all come together. loving this! Oh, and congrats! One of my favorite parts of expecting is putting the nursery together! xo love it! somebody's getting into "nesting" mode! :) Looks like a lot of fun projects. Good luck to your hubby! Love your nursery ideas Natasha thanks for sharing them with us on our blog! 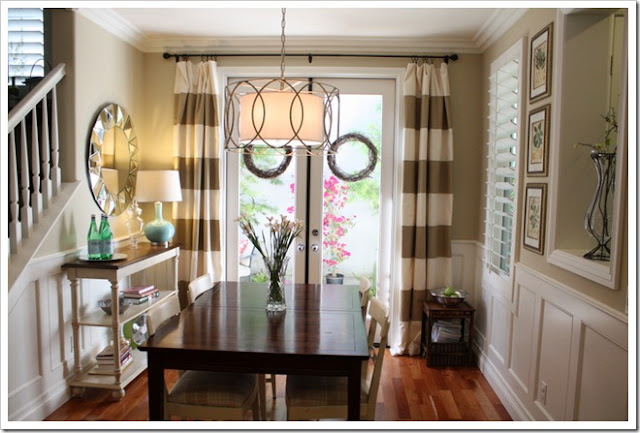 :) And I love the craftsman door idea and Courtney's drapes are gorgeous! 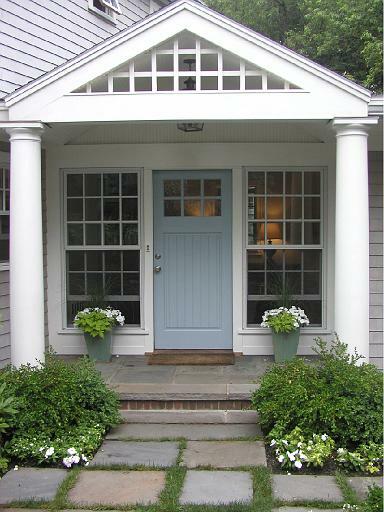 That blue craftsman door is perfect! love your ideas. love your guest post today... i have to add some home improvements to my to do list as well... ha! That is quite the home improvement list. You must go with barn doors - so cute! Also, I think my favorite item on your list is the NURSERY!!!!!! Love your updates! Especially the dining room curtains! I love the pillows you posted for inspiration! The brown zebra print is great! our honey-do list is growing a lot these days as well...totally feel your pain! ours include curtains for the formal living room, finishing the nursery, finishing decorating the bookshelves down in the family room, getting backsplash for the kitchen, and having each room decorated! I've been living in my apartment for ... 3 years. And I've been meaning to get it looking all nice for 3 years. Now I only have one to go and I feel like it's useless. That's a great list. The first image is incredible. I may need to do that, too!! Have a great day. 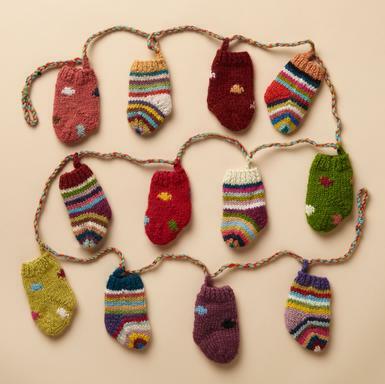 ohmygosh love the baby socks! SOOOOO adorable. I also am smitten by a barn door. This blogger did one a month ago. I like your idea of bolting two doors together. She got the door hardware for $130. The nursery will be exciting!!! #1. WD40 works great at cleaning the stainless steel fridge. #2. Unless your heart is set on it and you are dedicated to being an uber freezer organizer, DO NOT GET THE DRAWER FREEZER. we hate our GE one. things get buried so you forget what you have, and then things fall behind the drawers and you have to basically crawl in there to get them out or remove the drawers. Also, if you want to clean the freezer you have to take the drawers out. And if the ice maker malfunctions the drawers jam. My mom and I were in Best Buy last week and saw a side-by-side fridge/freezer and our hearts melted. #. If your heart is set on the freezer drawer, check out the french door fridge and not the big ol' honkin door version. You so have to check out Ashli and Lee's barn door! Lee made it from scratch and plans to do a tutorial. mini manor is the name of their blog. 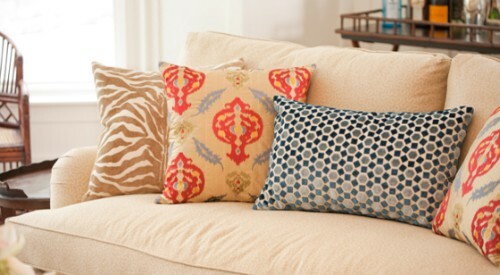 Loving those pillows too!!! that sock garland is ADORABLE!!! i love it! i can't wait to see your nursery! and i think stripes in the dr will be perfect! our tv is posted smack in the middle of the wall.. and a total eye sore.. i was just telling Justin we should make an oversized frame for it, and tile it with subway tiles (: tvs are so hard to decorate around!! i love your list. i've been thinking about painting a standard door and using barn hardware too. it sounds good in theory, right? 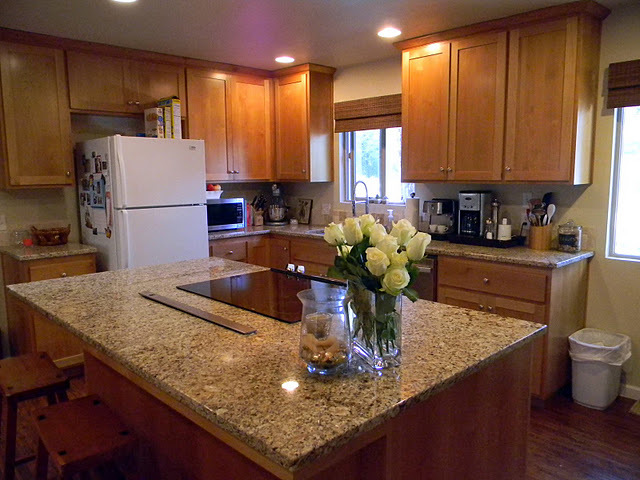 There is so much storage in the cabinets! I love the barn door idea! And I can't wait to see what you do in the master bedroom and nursery! BARN DOORS are a must! I love them! Great ideas! Barn doors? Amazing. I also can't wait to see baby's room! Such an adorable inspiration board over at your guest post! We got our media console from Rooms To Go and I love it. 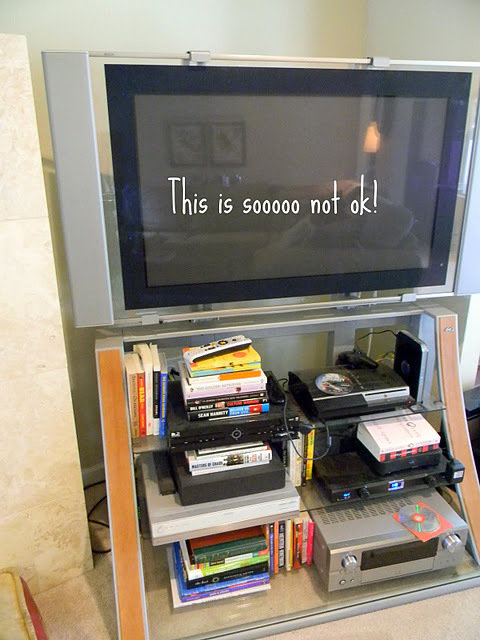 Conceals everything but the cable box, wii and PS3, but it's got a small cut out for that. Then two huge drawers we hide DVDs and video games in. 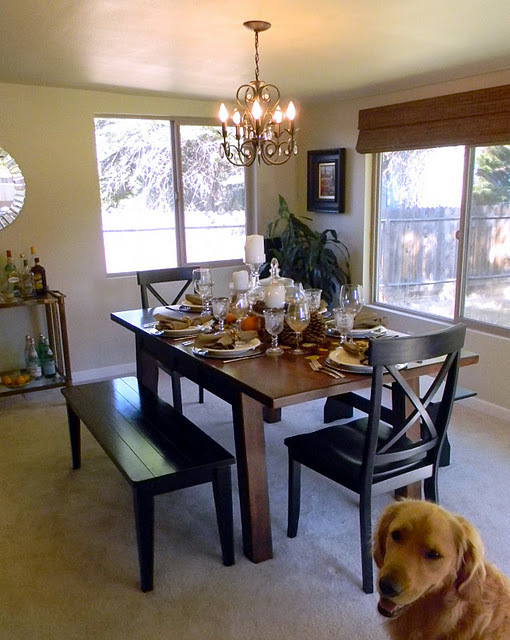 I think curtains will bring your dining room together nicely! So excited for you!! You will have to keep us posted on the nursery decorating :) !! We just sprung for a new stainless steel fridge for Christmas too! It's so lovely to have something new but also with the new bells and whistles too! Love the improvements you two want to make around the house. I'm guessing you are going to be busy every weekend until your baby arrives! I just had to comment on the title of this post: the honey-do list ;) It has always made me smile and laugh. Can't wait to see how things come along! My list is a mile long and nothing ever gets accomplished!! Love the idea of zebra pillows and barn doors. Can't wait to see your nursery it will no doubt be gorg! I always get such a rush when I finish up the "little" things. They truly do make a big difference! That seems like a doable list! I am loving striped curtains too. ohh I love lists like this, I have one of my own! Cannot wait to see all of the progress, you have a beautiful home already!! Wow, great list!!! I cant wait to see you work your magic! And your tiny tummy is so cute!! Glad youre feeling well. And what does it say about me that for 'movement' I immediately thought you were referring to poop?! I think this is my first time to say poop in a comment! And look, i said it twice!!! That is quite the list, girl! I think I'm most excited about the nursery, too! They are just so fun, there are no rules to what you can do for nurseries (c: YAY! loving all your inspirations and everything that you want to do! i def. need to have some goals for my house for this year! thanks for the inspiration! you have amazing ideas. i must say that i looove the curtains and closet doors! Whew! Looks like you have a lot of work to do! Can't wait to see the updates! Looks like you are going to be a busy girl this spring! Love those barn doors and the pillow inspirations! Ahhh! So behind. Thanks for the sweet shout out with the drapes. You have quite the list my dear. Can't wait to be along for the ride. 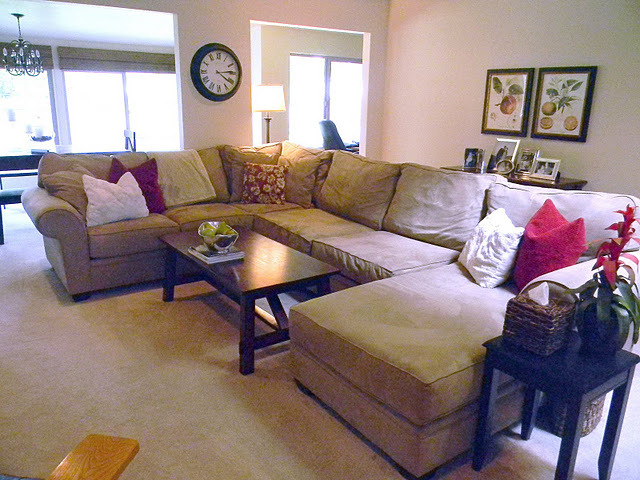 Fun that we are both switching up the red in our family rooms! The project I am most excited to see is baby's nursery. Can't wait. I so love the sofa! Actually I love everything.Very comfortable and cool.I will bookmark your blog and have my children check up here often. I am quite sure they will learn lots of new stuff here than anybody else!